I popped my old Capreo wheel back on but since I’d switched to a new chain to go with the new Alfine cog, I decided to replace the old worn Capreo cassette with a new one that was awaiting the fine day this whole business was resolved and my current trike had become my wife’s. Of course that day hasn’t come yet, but plans change. This did give me an opportunity to explore why my shifting was so bad before. Though never as good as Alfine Di2 (when it’s working properly), my shifting with the Capreo externally-geared hub hasn’t always been bad. As with other drivetrains in my past, the deterioration in shift quality was insidious. Things were fine until one day the accumulation of problems reached a level in my consciousness that they became annoying. Then, after about 2,800 miles on the original Capreo wheel that came with my 2008 ICE Q trike, the chain began skipping on the smallest (9-tooth) cog. My chain was at the limits of acceptable wear so it needed to be replaced but I knew from previous experience that if I didn’t also replace the cassette, I’d likely start skipping on the smallest couple of cogs. Since I was already skipping even with the worn chain, I knew the cassette had to go. But $126 for a 9-speed Capreo cassette is hard to stomach, especially considering that’s almost double the price of a much higher quality Shimano Deore XT cassette. So I took advantage of a good price on a used XTR hub and slapped a $30 SRAM PG-950 cassette on it. It may be heavier (I don’t know) but I think the SRAM cassette shifts better than the Capreo and at $30 I just replace it along with the chain. I’ve lived with the loss of my high gear (11 teeth instead of 9 on the small cog) ever since. Fast-forward to the beginning of my Di2 experiment. I was still running the XTR hub with a SRAM cassette and couldn’t fix the now-horrible shifting no matter how I adjusted the derailleur. It was slow to shift into certain gears and some required over-shifting one gear and then back to get it to drop into the desired gear. Many gears were excessively noisy as well. At some 8000 miles on the 9-speed SRAM X-9 grip shifter I knew from past experience that it was likely shot, so the first thing I did was replace it. Shifting noticeably improved and I figured the remaining shifting problems were due to the fact that I was running a chain and cassette that I know were worn out. With the Capreo wheel back on and with a brand new cassette and nearly new chain and shifter, shifting is nearly normal but I still have to over-shift to get from 3rd gear to 2nd no matter how hard I try to adjust it out. This is on the middle ring in the front. The only obvious culprits remaining are the cables and the derailleur itself. I admit I’ve bent and straightened the long cage of the derailleur a couple of times. The cable seems to be moving freely but I should lube the inner cable. (Neither of these could be the problem with Alfine Di2.) Of course it could also be the brand-new Capreo cassette giving me fits. In replacing the Capreo cassette I discovered a problem I’ve never seen before. I had to pry the cassette from the hub because many of the cogs had worn significant grooves into the spline. I see a little bit of wear on all the used splines I’ve ever inspected, including my XTR hub with over 13,000 miles on it, but nothing like what I’m seeing on this 2,800-mile Capreo hub. The smallest cog is rotated so far into the spline that I wonder if it might affect shifting. It’s true that I’m sometimes a “masher” who pedals hard in too high of a gear. It’s also true that I sometimes ignore cross-chaining since on a trike with such a long chain (and an idler in the middle of the run), chain/cog alignment is rarely a problem even with the front and rear derailleurs shifted to their opposite, outer cogs. I try not to do this, but if I mashed up a significant hill on the smallest cog in both the front and rear, I could have applied significant and unnecessary force to the 9-tooth cog that has cut such a big gash in the spline. But I’m not sure why I would have done this so much more in the 2,800 miles back in 2008-2010 than the more than 15,000 miles I’ve pedaled in the years since. Over 4,000 of those pulling my child and all our gear on a self-supported ride across America. On paper, Capreo is a great solution to the loss of the high gear when running a 20” rear wheel. In operation, I remain underwhelmed. A Capreo hub is expensive, proprietary to ICE, and requires the use of a proprietary cassette that is lower quality (in my opinion) and around four times more expensive than the least expensive SRAM cassette. And in my experience the cassette/hub combination seems to shift worse and wear faster than my XTR hub with SRAM cassette. It’s just as well, if I wind up going with Ultegra Di2 I can’t use Capreo anyway. Kurt: Do you know if the Deore XT cassette can be swapped onto the ICE’ Capreo hub; or do you have to go “all in” like you did and swap out the hub by rebuilding the wheel in order to use that Deore XT cassette? 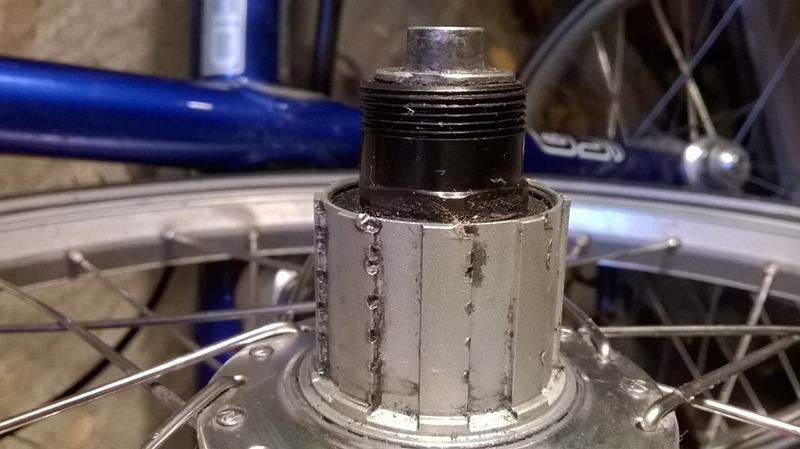 No, one of the things I dislike about the Capreo hub is that it only works with a Capreo cassette. And Capreo cassettes are expensive. It’s actually the low gears you should be worried about, not the “mashing in too high” gears. The low gears are the ones with the greater mechanical advantage. The same amount of pressure from your feet leads to higher torque and therefore more force on the chain, cassette and spline. For example, Rohloff specifies a minimum ratio for the crank/cog tooth ratio (about 1.9:1) for the speedhub gearing, as lower ratios result in too much stress on the gears. That’s true. But it was the high (small) cogs in the rear that showed the worst grooving on the Capreo spline. I was speculating I might have caused them by “mashing” while cross-chained, from the lowest gear (smallest cog) in the front. Normally to get that same gear you’d be operating from the middle cog in front and a bigger cog in the rear.